Boulder City Nevada is a clean green oasis on the outskirts of Las Vegas desert. Located just 20 miles from the glitter casinos Nightlife and excitement of the Las Vegas strip. Boulder city Nevada is just a few miles from the magnificent Hoover Dam. Boulder City offers a quiet, relaxed living environment, no gaming allowed. With unique and high end quality housing Boulder City Nevada has a population of just over 17,000 people. Most of Boulder City residents live in a quaint, small town with a small town atmosphere with no commercial gaming allowed. Low crime rate and high quality police and fire protective services. With excellent schools and quality housing. Boulder City is the choice of the discerning Las Vegas Real Estate Buyer! 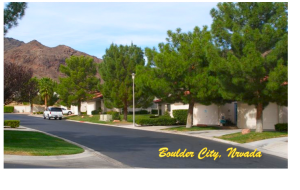 Yes Boulder City homes for sale, Quality houses and homes to the highest standards. Only 45 Min’s away from mainstream Las Vegas, Boulder City Nevada offers a clean get away! Beautiful scenic views of Lake Mead and the surrounding hills are accessible throughout this private valley. Price per square foot is a bit higher than Las Vegas. Incredible high end homes and mid priced condos are here! Luxury homes, luxury real estate, luxurious properties with phenomenal views of the valley and Lake Mead. Search our Boulder City Nevada MLS listings. We have the best luxury homes, condos and real estate available in Boulder City via the M.L.S. Remember with our quality service and skillful negotiating skills we are sure that Premier realty group Can negotiate the best deal on your Boulder City Home. Foreclosure bank owned reo homes are now the hot ticket in Boulder City, wide range of condos, luxury homes are now available. Realtor Jonathan Abbinante sells Boulder City. Lake front homes and r.e.o bank owned foreclosures are only a phone call away. ROCKIN THE HOUSE realty views M.L.S Boulder City Listings weekly, contact us before making a move. Taking a Great Realtor in the Boulder city Real Estate market is very important to help you achieve a fantastic price on your next home purchase. Boulder City Nevada has less rental property than other Las Vegas home areas. With less crime than any other area of Las Vegas you are assured of a fantastic comfortable and pleasant living experience when you buy a home in Boulder City Nevada! Be sure to contact Jonathan Abbinante Realtor, for all your Boulder City Nevada Real Estate sales.